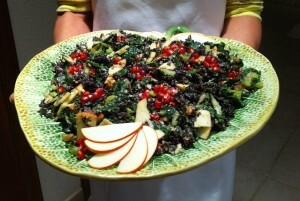 Kale Waldorf Salad - Vegans Eat What? Vegans Eat What? With two kinds of kale, this dish is a unique spin on the traditional Waldorf. Lightly toast walnuts in a dry sauté pan over medium to high heat, watch carefully. Blend half the apple, 1/4 c. walnuts, 2 T. raisins, mustard, vinegar and salt; pulse until smooth. Add a bit of water if needed, end result should be a thick cream. Clean, de-stem and roll kale leaves into a cigar shape and shred with knife. Massage dressing with shredded kale until completely covered, add celery and apple slice chunks, massage lightly. Add nuts and final fruit selections and allow salad to rest for 10 minutes. The salad dressing will be easier to blend in your food processor or blender if you double this recipe. If you own a small container for your blender or own a mini food processor, it would not be necessary to double.